Moving to Brooklyn? Studying in Brooklyn? I can help you evaluate neighborhoods, locations, transit, and attractions. I can provide an orientation to one or more neighborhoods, focusing on issues of importance in choosing a residence. I've helped people relocating to Brooklyn, whether just after college, in mid-career, or when they're retiring. I've also introduced college/university students, and their families, to the neighborhoods around the institution where they'll be studying. Often, people don't realize how much New York's varied transit system can help them access. 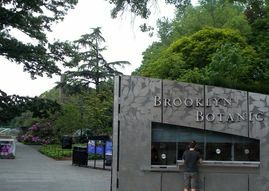 Do remember that Brooklyn is a large place, and a tour that includes many neighborhoods can take a while. Also note that a look at borough highlights, such as in the Brooklyn 101 tour, does not necessarily mean those are the neighborhoods you would live in. I recommend using public transit to get around, since that duplicates the typical experience. But that can make for a longer tour (say, 5+ hours) if you want to see several neighborhoods. So we can also take taxis. Issues to consider include access to transportation, shopping/nightlife, access to parks, safety, neighborhood flash points, connection to other neighborhoods, even the location of the library. Sure, real estate agents may provide a version of this service, especially in a truncated area, but I can offer a broader perspective. Also, I'm not trying to sell you anything! So I might be able to discuss issues that might be obscured in real estate listings, such as the actual proximity to neighborhood amenities, the size of units, and the history and rent-regulated status of a building. For housing, Streeteasy offers a neighborhood search. Also see RentHop, Zumper, and Naked Apartments. You also could try Craigslist (click to open categories), but do recognize that not every listing is reliable. Please note that tours like Brooklyn 101 or Brooklyn 202, while great introductions to the highlights of Brooklyn, traverse neighborhoods where housing is expensive. If you're on a tight budget, you could request a custom tour focused on neighborhoods you find affordable (please do some research; see links at left), or you could add some of the latter to a tour like Brooklyn 101. For my fees, please click here. Brooklyn can be complicated. For example, I've had people tell me they were interested in Bushwick, but the apartments in that very large and complex neighborhood they--or their kids--could afford were not near the relatively small zone where "Bushwick" has generated so much buzz.​ That's why it's helpful to do some research, or to have enough time to explore.